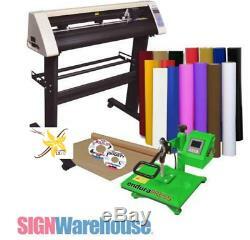 SignWarehouse 31" R Series Vinyl Cutter with 9" x 12 EnduraPRESS, VE LXi Apprentice Vinyl Software, Apparel Supplies, and Supply Coupons. Get Your Custom T-Shirt and Apparel Business Up and Going Quickly with this Package! 1 - Vinyl Express 31 R-Series Vinyl Cutter & Stand. Windows 7, Windows 8, Windows 10, 32/64 bit systems. Serial, USB (USB connection is accomplished through serial conversion). NOTE: The R-Series vinyl cutter is NOT Apple/Mac compatible and does NOT have a registration mark sensor for contour cutting after digital printing. Please consider SIGNWarehouse's Q-Series or Graphtec cutters for this ability. Powerful 500 grams of downforce so you can tackle a variety of jobs. Fast 24 inches-per-second cutting speed. Superior build quality offers tension-adjustable pinch rollers and a smooth-feeding media supply system. Best of all, the R-Series vinyl cutter value line is a Vinyl Express® cutter, arguably one of the most prestigious vinyl cutter lines in the world. In fact the whole SignWarehouse company is standing behind you. 1 - EnduraPRESS 9" x 12" Swing Away Heat Press. The swing away design of the EnduraPRESS SA12 keeps that hot platen away from the work area and ensures even pressure on thicker items. 1 - FlexiSIGN / Vinyl Express LXi Apprentice Software (Not a Trial Version). PC with 2.0 GHz Processor or better. 128 mb Video Card or better. USB 2.0 Ports (2 or more) and Serial COM Ports. Windows 7/8/10, 32 bit/64 bit. Vinyl Express LXi Apprentice is one of the most-popular brands of sign-making software in the world and sells for hundreds. LXi Apprentice is a complete text layout software that utilizes both Windows TrueType and Adobe Type 1 fonts. LXi Apprentice allows you to do simultaneous cutting and text designing of your signs. This is a cost-effective software solution for vinyl cutters just starting out that can grow with your needs. Don't be locked into a dead end software package with no upgrade path or a basic craft/hobby software. You can upgrade LXi Apprentice to the Expert, Master or Master Plus versions. Some reasons to use LXi Apprentice include. Design Central is your sign layout partner. Customize the interface to suit your work habits. Built-in spell check saves costly mistakes. Edit on-screen any effect applied to an object. Superior text and layout features. From the makers of FlexiSIGN software & FlexiSIGN compatible. Note: LXi Software is CLOUD BASED, no hardware hasp/dongle key is provided. Includes software manual in ELECTRONIC (not paper) format. You will need high speed internet for the initial software download and activation. 1 - Apparel Supply Package. Get your custom apparel business started right away! One (1) - 3 mil 16" x 20" Teflon Sheet. EnduraTEX Resolve Plus 15 x 1 YD heat transfer film - One (1) roll each of Black, White, Red, Vivid Blue, Golden Yellow, Brown, Purple and Pink. EnduraGLOSS 24 x 1 YD sign vinyl - One (1) roll each of Black, White, Cherry Red, Vivid Blue, Daffodil Yellow, Beige, Burgundy and Lime Green. Two (2) Clipart Collections - Wildlife and Silhouette Society. SignWarehouse reserves the right to substitute clipart and/or vinyl included with packages due to their availability. Everyone needs supplies to run a business and we can help. These coupons do not work with any other web site. The item "Vinyl Cutter Plotter & Heat Press & Software Sign / T-Shirt / Apparel Business" is in sale since Monday, April 23, 2018. This item is in the category "Business & Industrial\Printing & Graphic Arts\Plotters, Wide Format Printing\Cutters- Wide Format".